Predicting that the United States men’s basketball team will win gold in Rio de Janeiro is like saying rapper Kendrick Lamar will spit fire or President Barack Obama will stay black. There may be no bigger Olympic favorite than this 12-man band of brothers. So how are they mentally preparing for their opening game against China, which the U.S. beat down by 50 points just last week? With apparent hypnosis by head coach Mike Krzyzewski, who clearly has drilled into his team the importance of not taking anything for granted. 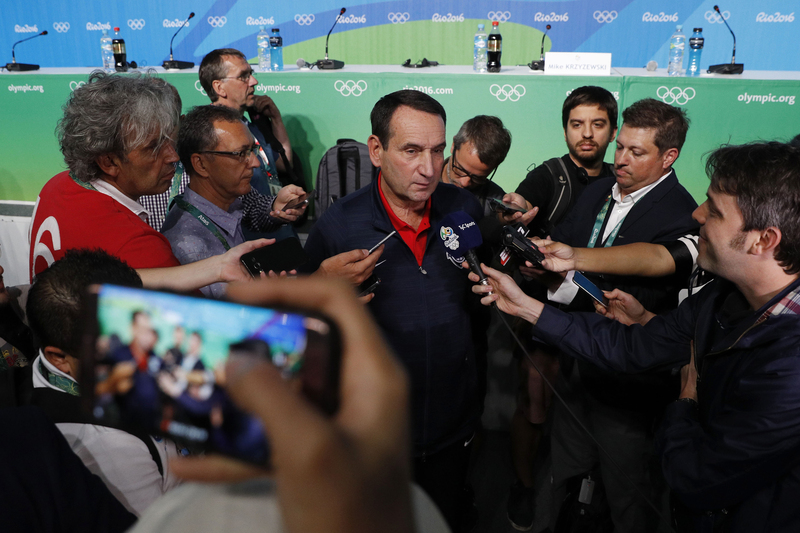 Team USA coach Mike Krzyzewski speaks to the media during a news conference during the Rio 2016 Summer Olympic Games at Main Press Center. Yes, coach, there are great players all over the world. But arguably none of them would even be selected for this U.S. powerhouse whose weakest link is … Harrison Barnes? DeAndre Jordan at the free throw line? An unauthorized halftime photo shoot by Draymond Green? Still, the players are saying all the right things. Except China, which lost two games to this U.S. team during an exhibition tour by a combined 99 points. Or Nigeria, which saw Festus Ezeli and Al-Farouq Aminu withdraw. Or host Brazil, which is missing Anderson Varejao and relying on the aging duo of Nene and Leandro Barbosa. There are some competitive squads in Rio. France starts NBA stalwarts Tony Parker, Rudy Gobert, Boris Diaw and Nicolas Batum, plus Euroleague MVP Nando de Colo. For Spain, Marc Gasol is out, but the team still has his brother Pau, Nikola Mirotic and a bunch of bearded guards you’ve seen getting torched in the NBA. 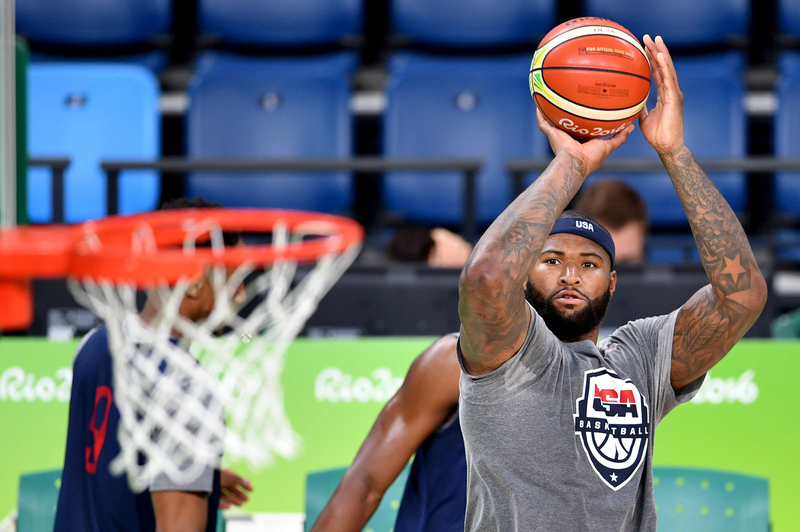 Team USA center DeMarcus Cousins shoots during a basketball training session at the Carioca Arena 1 in Rio de Janeiro on Aug. 4, ahead of the Rio 2016 Olympic Games. But first, China, on Saturday, at 6 p.m. EST. USA Basketball learned this humble approach the hard way. After American college stars could no longer compete with grown men from Europe, the United States sent its first team of NBA players to Barcelona, Spain, in 1992 — the legendary “Dream Team” of Michael Jordan, Earvin “Magic” Johnson, Larry Bird & Co. The United States won gold again in 1996, with Shaquille O’Neal and Hakeem Olajuwon on the team, and in 2000, when Vince Carter delivered the greatest dunk of all time. Then came the disastrous 2004 Olympics in Athens, Greece, featuring an entitled and overconfident team that included Allen Iverson and Stephon Marbury, plus young bucks Carmelo Anthony and LeBron James. Puerto Rico roasted the United States by 19 points in the opener, Lithuania beat them by four and they lost to Argentina by eight in the semifinals. The U.S. team’s bronze medal might as well have been tin. 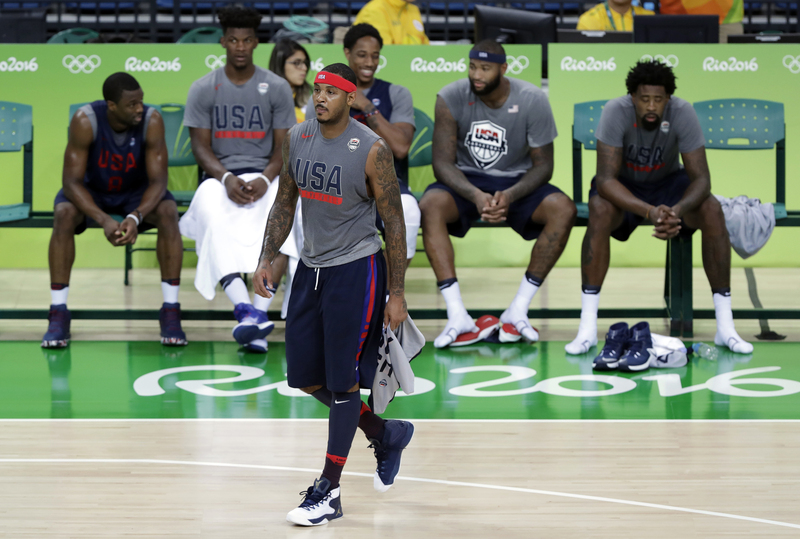 Team USA’s Carmelo Anthony walks off the court following basketball practice at the 2016 Summer Olympics in Rio de Janeiro on Aug. 4. That’s when USA Basketball overhauled the culture of the program, made Krzyzewski the head coach and revived the monster that we will see in Rio. “I’ve been a part of it since 2004,” said Anthony, now on his fourth Olympic team after gold medals in 2008 and 2012. “I know what it felt like when the rest of the world was supposedly catching up with the USA as far as from a basketball standpoint.